You'll be able to explore New Eden without paying a single ISK. After over a decade with a straight subscription model, the massively multiplayer space RPG EVE: Online is adding a free-to-play tier. While paid accounts will still exist for new and old players alike, the new free accounts will give gamers basic access to the vast EVE universe, "New Eden." It's been surprising how long EVE developer CCP has held out on free-to-play. New Eden may have been home to some of the most famous conflicts in video game history, but that hasn't stopped subscribers leaving in droves. Introduced in 2003, the game peaked with 500,000 subscribers in 2013 (the last time CCP gave official figures). From comparing activity logs and historical player figures, the current subscriber count is likely less than half of that peak. 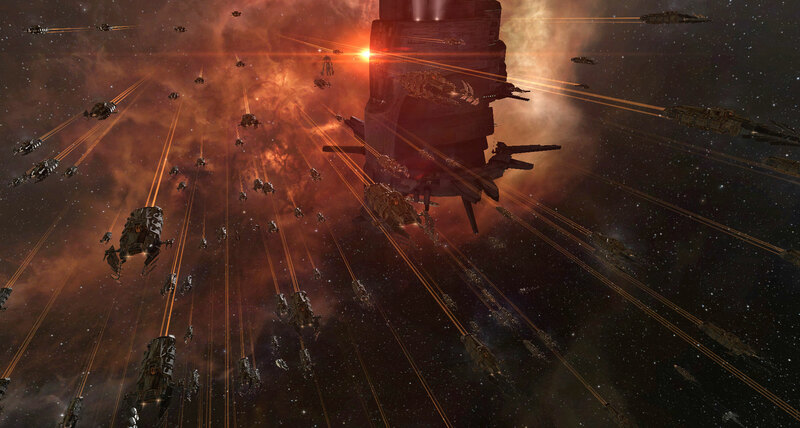 Dwindling player counts are a problem for many MMOs, but it's perhaps tougher on EVE than most. Rather than having tens or hundreds of servers running independently like, for example, World of Warcraft, EVE offers a single persistent universe in which all players participate (excluding the Chinese server). When half as many players are online in WoW, you can just visit a server that's fully populated. When the same happens in EVE, it's half as busy as it used to be. CCP has been trying to increase its EVE player counts in many ways. Broad changes to the game, such as wormhole expeditions, faction warfare and incursions kept gameplay fresh to a point, and regular expansions since have added new things to do. Then there was the 2013 free-to-play shooter Dust 514, which tied in heavily and, as well as being a money-maker on its own, was supposed to attract fresh blood to the main game. More recently, it's invested heavily in VR, with EVE Valkyrie and EVE Gunjack offering action-oriented spins on New Eden. None of the changes are likely to be as significant as the switch to free-to-play. CCP Games says it's been planning to make the switch for a while, but it's only recently been possible to do so. "Part of our vision for the future of EVE has included more open access for some time, but with the interconnected nature of the game comes vulnerability," it said in the announcement post. "We knew that if the flood gates were opened in the wrong way, we could see anything from server meltdowns to the collapse of the EVE economy. Over time, our hardware has improved, code has been untangled (mostly!) and we've found a design we believe in." The big influx of new free-to-play accounts should breathe fresh life into the game, and CCP hopes many gamers who have left EVE over the years will come back as free players. In the universe's lore, these free-to-play accounts will be known as "Alpha clones." Free players can trade, mine and fight just like regular subscribers, but skill progression will be slower, and limited to certain fields. Outwardly, there will be no indicators as to a player's subscription status, but their ship will give you a clue: Alpha clones will be stuck with the game's starter spacecrafts: Tech one Frigates, Destroyers and Cruisers. Existing players' accounts will behave as they always have, except if their subscription lapses they'll be dropped down to Alpha clone status. To be clear, any progression made won't be lost, it's just as a free-to-play account those skills will be locked. CCP is actively encouraging existing players to court the Alpha clone accounts, bring them under their wing and boost the strength of their factions and alliances. The spin is that this will make existing players' games fresh and exciting by bringing thousands of new players into the world. Of course, new and old players alike will be able to upgrade to full accounts (or "Omega clones," under the new nomenclature) by paying a subscription fee (typically around $10 per month). The changes raise plenty of questions about how EVE will function following the shift. The free-to-play subscriptions will open up in November as part of a feature update called Clone States, and we suspect there'll be a lot more detail on how the newer New Eden will work. From the initial announcement, though, this seems like a carefully considered way to bring new players into the EVE universe without annoying fans that have sunk thousands of hours and dollars into the game.